Back in my corporate days, getting dressed for work during the winter was a bit challenging for me. Every night I would take about an hour to come up with some cute plus size winter work outfits. One of the reasons I found it challenging was because I hated to wear tights. Also, having to layer to stay warm. Riding on the trains with a heavy coat plus layers under it made for an uncomfortable ride. While I wasn’t a huge fan of layering, I took my focus off it and just started to get into the groove of creating stylish work outfits. Eventually, I became a fan of wearing tights and learned to layer lightly. What really helped was the improvement of plus size work clothes. I’ve always had the ability to mix classic work pieces with trendy fast fashion pieces. Nowadays, we have countless options for plus size work clothes. 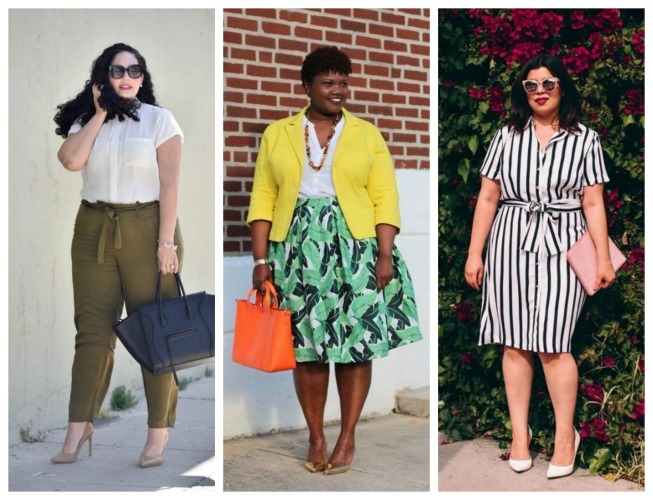 Today, I want to share with you some amazing plus size winter work outfits. These are the type of looks that can take you from desk to dinner. You can actually hit up the after work clubs in some of these looks. Do you guys remember the after work lounges? Do they still have them? 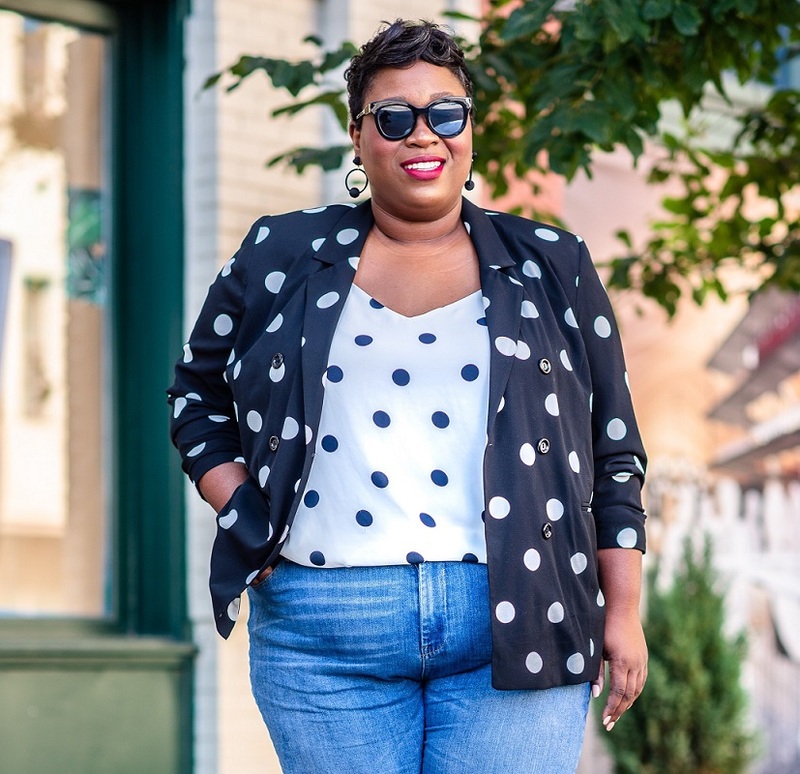 These plus size winter work outfits are all from Ashley Stewart. I think Ashley Stewart does a phenomenal job of producing trendy and modern plus size work looks. All of these looks can also play nice with your weekend wardrobe. This first look is definitely a trendy yet modern office look. A faux leather puff sleeve top paired with plaid trouser pants is office appropriate. It also is cute enough to meet your friends for drinks after work. For some reason when it comes to winter work outfits, people always think of dark colors. Please understand that you can wear bright colors in the winter. One of my personal tricks to making bright spring like colors work for the winter is by pairing it with black. Case in point, checkout this bosphorus colored pantsuit. It looks great with a black turtleneck. Also, you can wear it with a black button up or even a white button up. Don’t be afraid to wear prints to work too. I’m not talking classic stripes or polka dots but I’m talking animal prints. Snakeskin is a hot trend right now. You can make it office appropriate by pairing it with the right pieces. This snakeskin printed jacket paired with a full skirt is a great look for work. Especially if you work in a creative environment. You could also pair this jacket with a plain black pencil skirt or even a pair of trouser pants. When it comes to dresses, I think we often think about sheath and shift dresses for work. I’ve always preferred dressy casual dresses that look great with heels and just as cute with flats or sneakers. This lace up chain self belted dresses offers a great print and comfy silhouette. A pair of ankle boots or even knee high boots would work with this dress for winter. I read this article and found it very interesting, thought it might be something for you. The article is called Trendy Plus Size Winter Work Outfits and is located at https://stylishcurves.com/plus-size-winter-work-outfits/.